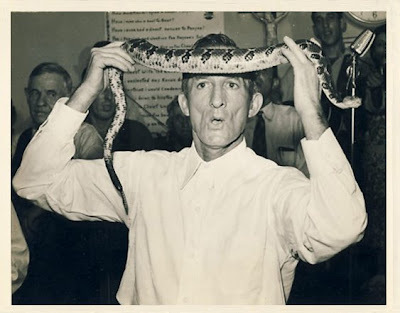 In light of the recent death of a religious snake handler here in the United States, I share with you an International News Photo from October 23, 1947 of snake handler W. H. Edmonds holding aloft a poisonous timber rattlesnake during a worship service in Harlan, KY. Though outlawed, the practice obviously continues today in some remote regions of the United States. I'd like to introduce you to my first book, designed by me and produced by Blurb. It includes selected images from well over five years of photography. Check it out and I hope you like it.